Open System Preferences, click the Accessibility icon, and then click the Zoom entry on the left to see the settings you see here. To specify how much magnification is used, click the More Options button. On the sheet that appears, you can set the minimum and maximum Zoom magnification increments. From the keyboard, press ⌘+Option+= (equal sign) to zoom in or press ⌘+Option+– (minus sign) to zoom out. You can also display a preview rectangle of the area that’s included when you zoom. To have OS X smooth images to make them look better when zoomed, select the Smooth Images check box. 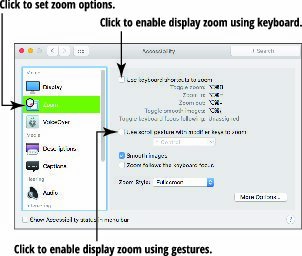 If you click the More Options button, you can also determine how the screen moves in relation to the pointer from the Zoom Options sheet: By default, the zoomed screen moves with the pointer, but you can set it to move only when the pointer reaches the edge of the screen or maintain the pointer near the center of the zoomed image automatically. (Optional) If you prefer white text on a black background, click the Display icon in the list on the left side of the Accessibility pane and select the Invert Colors check box. Note that depending on your display settings, it may be easier on the eyes to use Grayscale Display mode by selecting the Use Grayscale check box.